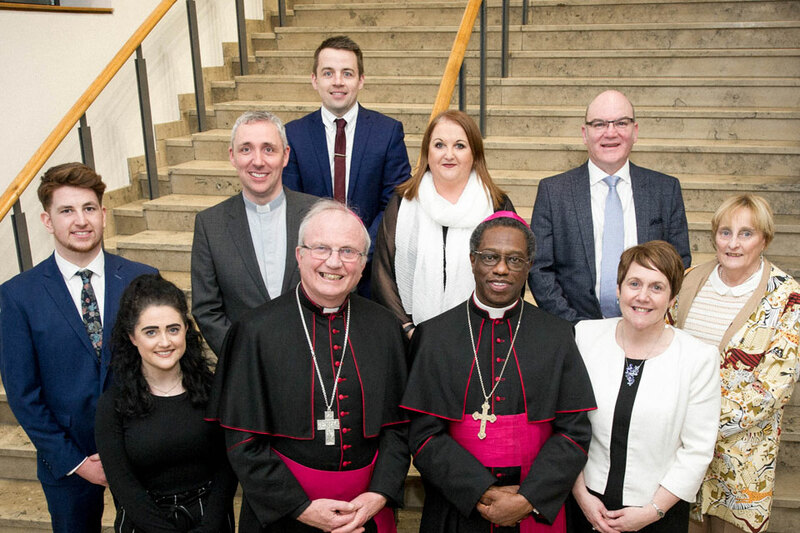 The Pope John Paul II Award team with His Excellency Archbishop Jude Okolo, Papal Nuncio to Ireland and Bishop Donal McKeown, Bishop of Derry. Front row L-R: Rebecca O’Doherty, Bishop Donal McKeown, Archbishop Jude Okolo, Therese Ferry. Middle row L-R: Emmet Mullan, Fr Paul Farren – Award Director, Anne Marie Hickey, Tony Brennan, Mary Boyle. Back row L-R: Emmet Thompson. The Pope John Paul II Award, founded in 2006 in the Derry Diocese, Northern Ireland is active in 20 dioceses in Ireland and is also running in the Archdiocese of Birmingham and the Diocese of Hexham and Newcastle in the UK. It is now actively promoted in the United States. The Award is coordinated from its head office in Derry, Northern Ireland. It was created by Fr Paul Farren in his role as director of the Derry Diocesan Catechetical Centre. The Award encourages young people to get actively involved in their parish and community and contribute in a positive way to the life of the Church.